Zeppelin-Staaken R.VI bomber. Image in public domain. Five Zeppelin Staaken Giant R.VI bombers drop 4,250 kilograms of bombs over London and Dover, killing twelve people and injuring six and causing £19,264 worth of damage. One of the dead is Eric Munro, an Australian soldier from Perth. William Wallace Murray saw just three months of active service before sustaining a gunshot wound that would prove to be fatal. On 17 September 1917 his battalion was engaged near Ypres in Belgium when a bullet entered his left buttock and penetrated his abdomen. Private Murray was evacuated to the nearby 3rd Canadian Casualty Clearing Station, where he later died of his wounds. He was 33 years of age. William Wallace Murray was born in Molong in 1884. His parents were Walter Rennie and Mary Jane Murray. He was educated at Manildra school. In March 1910 William – also known as Wal – married Ethel May Cotter in Parkes. Their son Arnold was born in Parkes in 1913. When William enlisted on 9 May 1916 he was living in Dora Street, East Orange, and working as a labourer. He spent four months in camp; he embarked for overseas service on 9 September, arriving in Plymouth on 26 October 1916. 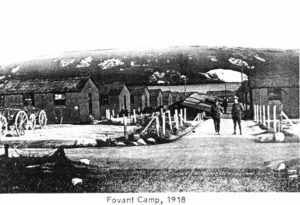 Wal undertook further training at Fovant and Perham Downs before proceeding to France on 28 February 1917. 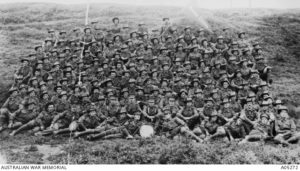 He was stationed at the 1st Australian Divisional Base Depot in Etaples until 11 April, when he joined the 2nd Battalion. Fovant Camp, 1918. Image in public domain. 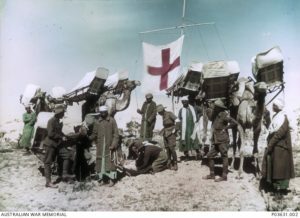 Three days later Wal was admitted to the 14th Field Ambulance with lumbago. He was transferred to Rouen, firstly to the 3rd Stationary Hospital, followed by the 6th General Hospital on 1 May 1917. He then spent several weeks at the 2nd Convalescent Depot, rejoining his battalion on 8 June 1917. Thirteen weeks later William sustained the fatal gunshot wound. According to a comrade who was with him at the time Wal didn’t appear to be badly injured, and even managed to walk along the Hooge road towards the dressing station. He was taken to the 3rd Canadian Casualty Clearing Station, where he died from his wounds. William was buried in the nearby Lijssenthoek Military Cemetery. On his attestation papers William indicated that he was married with two children. Indeed, one of William’s comrades who was interviewed by the Red Cross Bureau following his death said: “I heard him speak of two children”. Following her husband’s death Ethel was granted a widow’s pension of £2 per fortnight. A pension of 15 shillings a fortnight was granted to their son Arnold, a third pension to the value of 20 shillings a fortnight was granted to an adopted child, Clarice Muriel Grace Fenning. On the first and second anniversary of her husband’s death Ethel posted in memoriam notices in the press. Interestingly, the notices were annotated “Inserted by his sorrowing wife, and little son, Ethel and Arnold Murray.” No mention was made of Clarice. Image courtesy Molong Express and Western District Advertiser. In 1923 the Anzac Memorial Avenue of trees was planted along Bathurst Road to commemorate fallen WWI soldiers. A tree was planted in honour of “Pte WW Murray”; it was donated by JC Lee. Very few of the trees are still standing today. 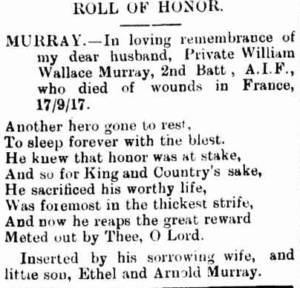 William Wallace Murray is commemorated on the following honour rolls: Orange Public School, St Luke’s Church Manildra, Manildra Soldiers Memorial Hall and the Cudal District Honour Roll, the World War I Roll of Honour on the southern face of the Orange Cenotaph and on panel number 33 on the Roll of Honour at the Australian War Memorial in Canberra. Many other members of the extended Murray clan in the Central West served during WWI, including William’s cousins George Wren Murray, Sage Clyne Sinclair Murray and Walter Stewart Murray, his second cousin, Hugh Miller Murray, and his uncle, George Murray. Orange historian William (Bill) Folster estimates that more than fifty men from the extended Murray family in the Central West answered the call to arms during the First World War. The Murray clan has a long tradition of military service. Sage’s namesake and great grandfather, Sage Murray, fought in the Battle of Waterloo, and his great uncles in the Sudan and Boer Wars. German submarine SM UC-37 torpedoes the British cargo ship Ventmoor in the Aegean Sea 15 kms off Skyros, Greece. The Ventmoor, en route from Mudros to Sfax, sinks with the loss of 21 of her crew. Alfred Allen McConnell was born in Orange on 24 September 1887, the fifth of twelve children of Ophir settlers Archibald Smith McConnell and Elizabeth Hetherington. Alf was working as a miner at Ophir when he enlisted on 30 December 1915. He was assigned to the 17th Battalion, 13th Reinforcement as a private and embarked for overseas service on 5 June 1916. Private McConnell arrived in England on 4 August 1916 and was hospitalised three weeks later suffering from mumps. Upon his release from hospital he was transferred to the 33rd Battalion, and in November proceeded to the Western Front in France. On 1 April 1917 Alf was admitted to the 11th Field Ambulance with pleurodynia (severe chest pain). The following month he was admitted to the 32nd Stationary Hospital suffering from pleurisy. He spent a month recovering, rejoining his battalion on 13 June. On 17 July Alfred sustained gunshot wounds to his left thigh and shoulder. He was admitted to the 3rd Canadian General Hospital in Boulogne, but promptly transferred to the Royal Victoria Hospital in England. Alfred was not discharged from hospital until 13 November 1917. On 21 April 1918 he embarked HMAT A29 Suevic for return to Australia. He disembarked in Sydney on 8 June and was discharged from the AIF on 11 July 1918. When Alfred returned to Orange on 10 June 1918 he was accorded an official welcome by the Mayor, William Bouffler, who greeted him and two other soldiers – William Davidson and Philip Edward Hines – at the Orange Railway Station as the Model Band played Home Sweet Home. In March 1921 Alfred married Christina Warren at St John’s Presbyterian Church in Orange. The couple had two children: Norman and Audrey. During the 1930s the family lived in William Street in Orange and Alf worked as a fettler. In the 1940s they moved to Sydney; 1949 census records list their address as 35 Storey Street Rozelle, and Alfred’s occupation as fettler. Alfred Allen McConnell died at his Storey Street home on 4 February 1952, aged 64. Christina continued to live in Rozelle; she died on 26 September 1970, aged 74. Alfred’s cousins, Charles Cornelius McConnell and Donald McConnell also served in WWI. Charles died of disease during his service; Donald returned to Australia in March 1919. Group portrait of officers, Non-commissioned Officers and sappers of No. 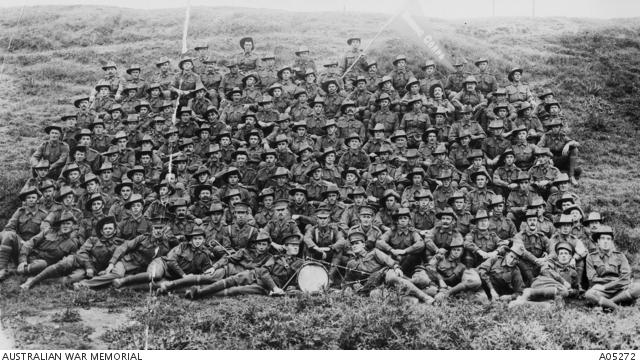 1 Company of the 1st Australian Mining Corps, November 1915. Image courtesy Australian War Memorial. Donald McConnell is in the second last row, 4th from the right, directly beneath the flag. Charles Cornelius McConnell is beside him, 5th from the right, just in front of the flag bearer. Donald McConnell was born in Orange in 1882, the youngest son of John McConnell and his wife Sarah. Donald and his older brother Charles Cornelius McConnell enlisted together on 4 August 1915 and were assigned to the 1st Australian Mining Corps as sappers. The brothers embarked HMAT A38 Ulysses in Sydney on 20 February 1916. Donald served in England and France. On 22 May 1916 he was marching back from the trenches when he slipped and fell into a ditch, resulting in synovitis (inflammation of the synovial membrane) of the left knee. He spent a month recovering, rejoining his unit in Etaples on 23 June. 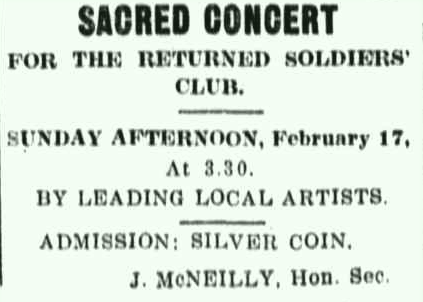 Sapper McConnell was hospitalised on several occasions during his military service. In October 1916 he received shrapnel wounds to the legs and feet and was evacuated to Edmonton Military Hospital in England. In February 1917 he was admitted to Parkhouse Hospital suffering from mumps. Donald served for more than three and a half years. He returned to Australia in March 1919 and was discharged from the AIF the following month. Donald returned to Orange, but later moved to Bathurst. During the 1930s he was employed as a linesman by the PMG Department. He never married. Would you kindly send me the record of Sapper Donald McConnell from World War One. He enlisted from Orange and saw service overseas. He is a very old man now. Been 85 and single; all his family have died. I am his niece. He is in a home for the aged and should anything happen to him I want him buried by the returned servicemen here and give him a Soldier’s Funeral. He’s forgotten anything about the war now so perhaps you could help. I wrote to the sub branch at Orange but they have no records and told me to write to Melbourne. Donald McConnell died on 11 July 1968, aged 85. He is buried in the Orange Cemetery, Church of England section. Donald is commemorated on the Holy Trinity Church Orange Honour Roll. Donald’s brother, Charles Cornelius McConnell, died of disease whilst serving in WWI. A cousin, Alfred Allen McConnell also served in WWI; he returned to Australia in June 1918. 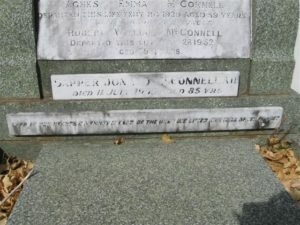 Donald McConnell’s headstone. Image courtesy Orange Cemetery. Four camel ambulances attached to the Imperial Camel Corps, Rafa, Palestine, Frank Hurley, 12 February 1918. Image courtesy Australian War Memorial.